Simple. Healthy. Delicious. These are the three words that come to mind when I describe this dish. 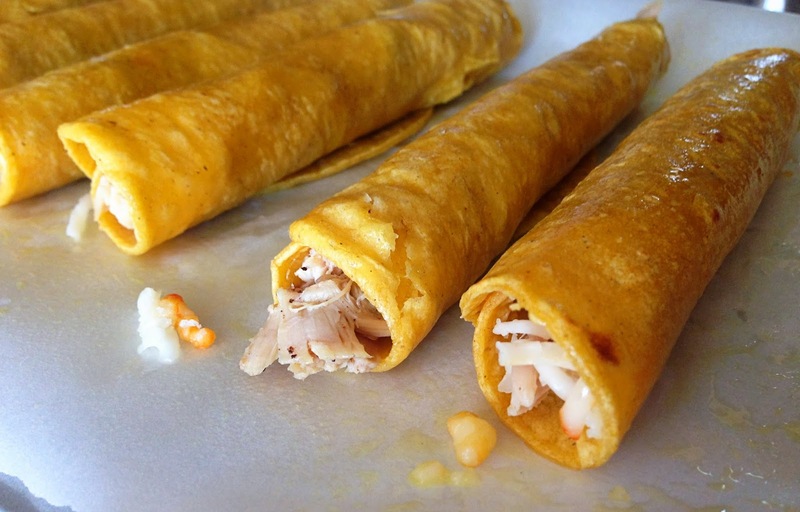 The crisp shell combines with the tender filling to create the perfect taquito and all without the grease of a traditional taquito! If you are feeding a large crowd (Calling all Superbowl Party hosts!) or just a few hungry kids on a Sunday afternoon (or any day that ends in Y really...), this is a throw-together kind of snack that will satisfy the masses. And if by chance you didn't happen to have the extra chicken lying around, you can grab a "hot and ready" rotisserie chicken at your grocery store (Walmart and Target for sure!) for around $5.00. 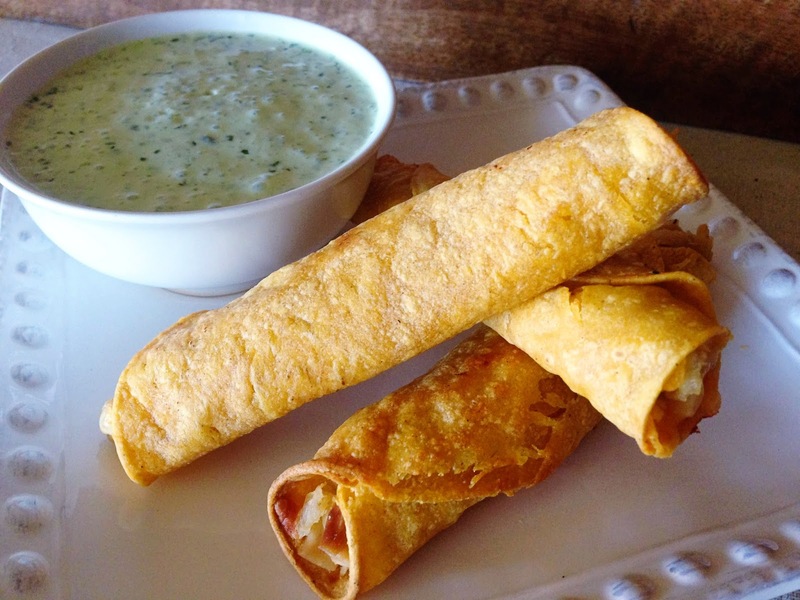 It will leave you with plenty of extra chicken to make lots and lots of taquitos! If this is the case for you, as it was for me, there is still hope! fold 1 paper towel in half and saturate it with water. Wring it out just enough to keep it from dripping excess but keep it as moist as possible. Lay it on a plate. 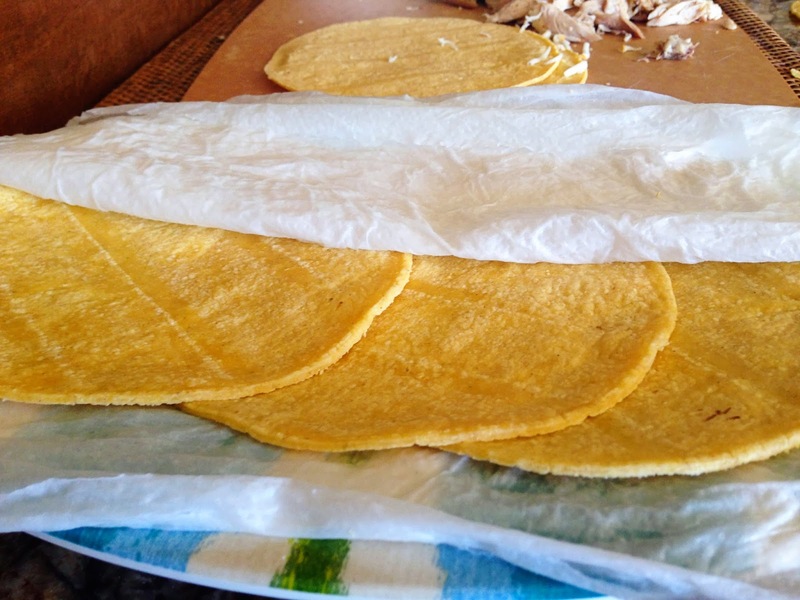 Place 4 tortillas on your plate like below and cover with another moist paper towel folded in half. Place in the microwave for 20 seconds. One at a time, keeping others covered, place them in a skillet over medium heat for 15-20 seconds or so to seal the surface, flip and heat the other side for the same amount of time. Remove from heat and spray both sides with fat free cooking spray and fill with chicken and cheese. Roll tightly and place edge down on baking sheet lined with parchment paper. Move on to the next tortilla, and then the next and the next. Re-wet the paper towels and repeat the same process with the next 4 tortillas until all 8 taquitos are constructed. 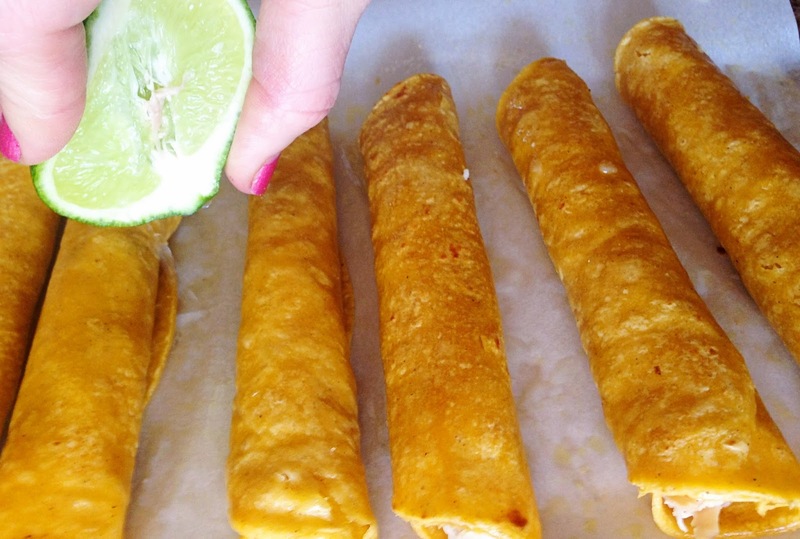 Squeeze a little lime juice over each of the taquitos (just because it is fun and festive). 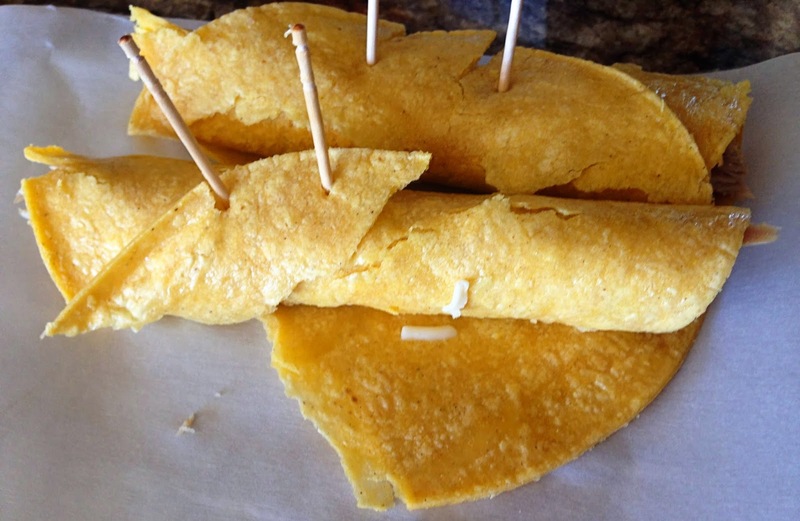 Place the taquitos in the oven for 12 minutes, flip and bake for an additional 5 minutes. 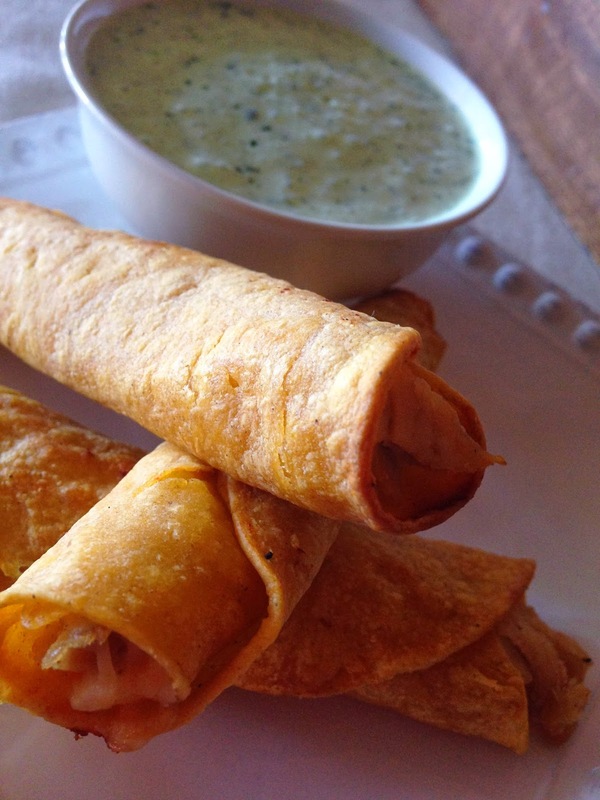 The taquitos should be crisp and the edges should have slightly browned. 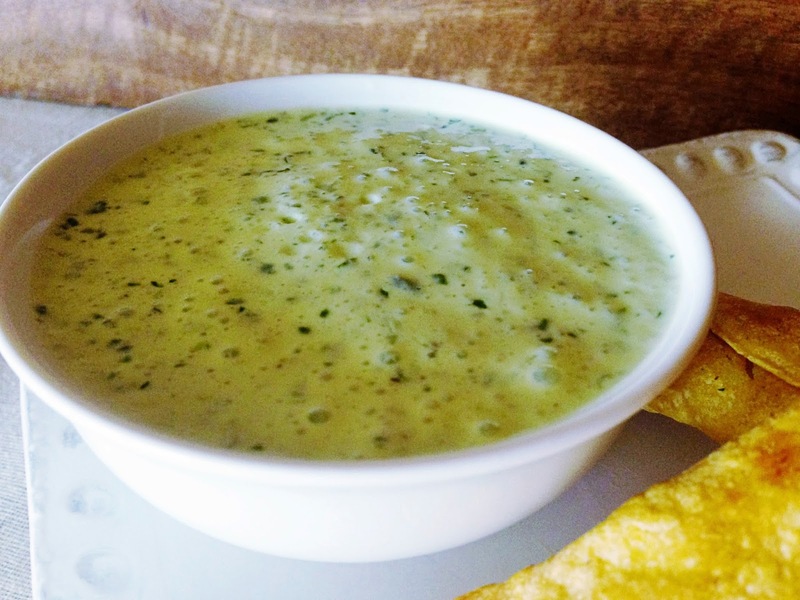 Serve with Cilantro Lime Sour Cream sauce below. Combine sour cream, cilantro, lime juice and zest in a mini food processor, process together and then add salt and pepper to taste. 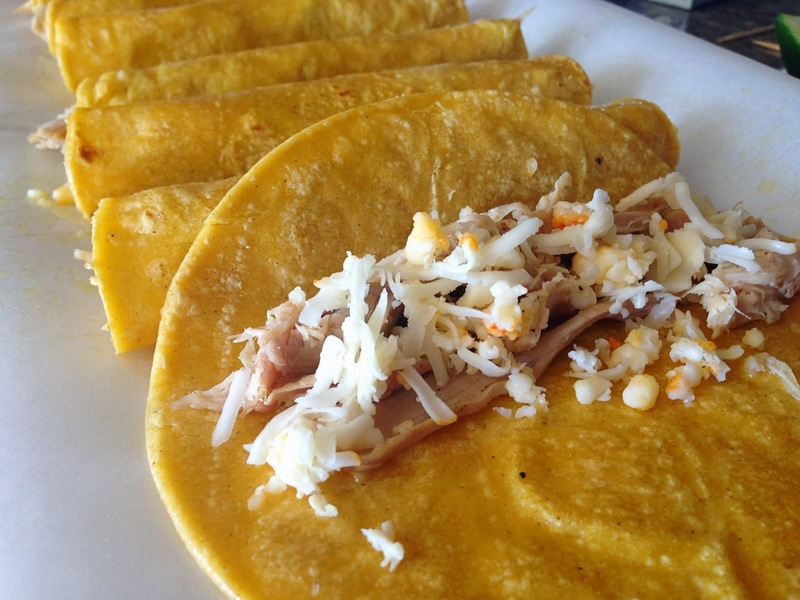 You can also serve these with the Guacamole Spread from my Patacones post last week. Try tossing that chicken into a stand mixer and turning the blade on slow to shred the chicken! Works like a charm.